The following account of Bengaluru’s garment industry supplements the account of Gurgaon given above by Archana Aggarwal. As in the garment industry of Gurgaon described above, so too in Bengaluru, unbearably stressful working conditions, combined with steep barriers to trade union organisation, have given rise to an unstable, indeed explosive, situation. Nevertheless, employers appear willing to live with this instability as the price of maintaining their brutal regime of surplus extraction. Bengaluru is one of the largest garment manufacturing centres in India, with a workforce of over 5 lakh, over 90 per cent of whom are women. On April 18 and 19, 2016, these workers came onto the streets in a massive, spontaneous protest. In its scale, suddenness, and effectiveness, this incident has few parallels. The upsurge among these workers was triggered by a news report in a Karnataka daily on a new ordinance of the Central Government regarding the Employment Provident Fund. The ordinance amended the Provident Fund rules to prevent workers from withdrawing the entire provident fund savings before retirement.1 Since workers frequently need to draw on these sums to meet current needs and emergency payments, the change greatly agitated them. On April 18, the demonstrations spread rapidly across a belt with a large number of garment factories, with mobilisations reportedly between 50,000 and 1,00,000. Huge numbers came out on the following day as well, with demonstrations spreading to fresh areas of the city and its surroundings. As documented by a fact-finding team (PUCL & WSS 2016), these workers had to face violence at the hands of the police force (overwhelmingly male). The police made arbitrary, indiscriminate arrests and detained large numbers on both days of the demonstration. Over the next few days, many workers were arrested from their homes and factories. All the workers interviewed by the team spoke of physical and psychological torture upon arrest. Women were also unlawfully detained at a private shelter. Arrested persons were repeatedly re-arrested when they received bail. The exorbitant costs of legal fees and repeated sureties placed a huge burden on workers’ families. Despite this, the unprecedented protests snatched a rare working class victory in the present anti-labour times: the Central Government was forced to hurriedly withdraw the ordinance. The study notes that the typical garment worker in Bengaluru is a woman aged 18 to 45. Another survey puts the average age at 33, with only 20 per cent being aged 40 or more; yet another, larger, survey puts the age range at 21-30. (CWM & GATWU 2015) The fact that the proportion of older workers is so low may indicate that the work is so stressful that workers ‘burn out’ over a certain number of years, and/or that managements do not hire older workers. Contrary to the dominant view that women workers’ income is merely supplementary, these workers are the main earners in their families. According to one survey, the average monthly income of a garment worker was Rs 7,066 in 2014-15, which was more than half the family income of Rs 13,816. Husbands of the workers were largely employed in the informal sector, with unstable earnings; thus families would be relying on the relatively stable income of the woman garment workers. (Ibid.) Nevertheless the myth of women’s wages being supplementary helps to justify low wages. 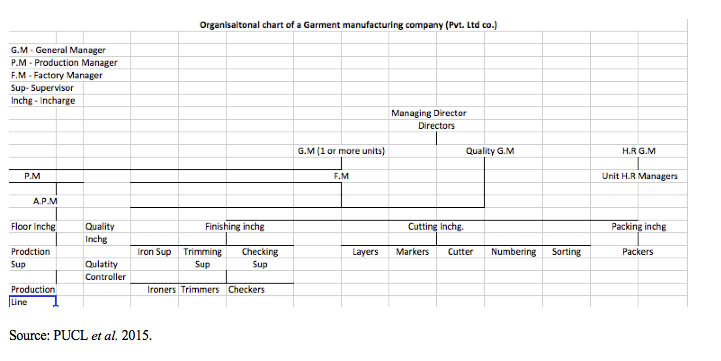 The following chart of the organisation of the factory (PUCL et. al.) depicts the multiple layers of managerial and supervisory staff through which the employers control the labour process. Despite their considerable size, the factories lack clean drinking water, clean or secure toilets, proper crèche facilities, and minimum medical facilities. Garment workers are prone to occupational health problems such as (in descending order) back ache, leg ache, gynaecological problems, eye problems, allergies, fever, and asthma. A garment worker falls ill an average of five times a year. (CWM & GATWU 2015) The work is noise intensive and there is constant exposure to dust; protective equipment, if provided, is frequently defective. According to the Joint Director of Factories (Medical), Department of Factories, Boilers, Industrial Safety and Health, Karnataka, “Most of those who are in the cutting section in garment factories are suffering from lung infections due to constant exposure to the fine dust from the fabric. Those who are involved in hemming and stitching button holes suffer from repetitive stress injury.” He said that tuberculosis, problems related to reproductive health and occupational health such as back pain and varicose veins are also rampant. (Bageshree 2016) A Bangalore University survey found that garment workers’ “inability to bear the rising cost of healthcare in private hospitals, coupled with sub-standard medical care services provided in the government hospitals,make their health conditions precarious.” Workers are given very restricted time for toilet or lunch breaks (e.g., two five-minute toilet breaks and a 20-minute lunch break), and hence many reduce their consumption of water, which exacerbates gynaecological problems. As a systematic part of exercising control over the workers and maintaining the intensity of work, the management employs various forms of mental harassment, including corporal punishment and humiliation of workers; verbal abuse; refusal to grant workers earned leave. An atmosphere of fear is fostered by prohibiting conversation among workers; applying extreme pressure to reach production targets; threatening to deduct production bonus or to terminate the job for mistakes committed by other batchmates; and stipulating higher and higher daily production targets. Workers who stand up against these tactics are singled out for harassment. As Marx said, the capitalist considers any part of the working day used by the worker for his/her own needs to be a form of theft: “The time during which the labourer works, is the time during which the capitalist consumes the labour-power he has purchased of him. If the labourer consumes his disposable time for himself, he robs the capitalist.” (Marx 1990, chapter 10) Garment workers report that “when a woman goes to use the washroom, a security person is sent behind her to note the timings and make sure she comes back soon. If she does not, the matter is reported to the management and a warning is issued. Further, the manager’s and supervisor’s offices are located opposite the bathroom so that they can keep a check on the amount of time spent on a bathroom break.” (PUCL et. al. 2015) No concessions are given for women garment workers during advanced stages of pregnancy in most factories. Overtime is routinely extracted, without payment at higher rates. By one calculation, the direct labour costs of the Bengaluru garment units come to 1 to 6 per cent of the (foreign) retail price of various items of apparel, with most items at the lower end of that range. A garment unit’s share of the total labour cost of a T-shirt, for example, is put at Rs 20, or 30 cents, just 1 per cent of the retail price abroad. (Of course this is not the only labour cost that goes into making the T-shirt, but the figure is nevertheless revealing.) Indian firms compete internationally by reducing wage costs to the lowest possible level. The wages paid are typically set at the minimum wage for garment workers (Rs 7,500-8,000 per month for different grades of workers in Greater Bengaluru in 2016-17). However, given the arbitrary and unscientific method by which minimum wages are set in India, these bear no relation to the minimum needs of a family. The Asia Floor Wage Campaign has attempted to calculate the food and non-food minimum needs for a family of two adults and two children,4 and arrives at a figure of Rs 18,727 for India in 2015 and Rs 23,588 in 2017. (Asia Floor Wage Campaign) Compare this to the combined incomes of the garment worker and her spouse: these were estimated in the earlier cited survey at less than Rs 14,000 in the year 2015. In other words, the full-time labour of two workers did not suffice to meet the needs of a family. Indeed the per capita expenditure on food in 2015 was found to be an alarmingly low Rs 834 per month, or less than Rs 28 per day. The survey found that family expenditure on provisions (cereals, greens, meat and fish, milk) remained nearly constant over the preceding four years. This meant that in real terms (i.e., after discounting for inflation), the worker in 2015 spent on the average around 20 per cent less per month on commodities than in 2012-13. The share of spending on commodities of total expenditure also declined from 41 per cent in 2012 to 36-38 per cent for the subsequent years. (CWM & GATWU 2015) This suggests that already low levels of food consumption are further depressed by the rise in non-food costs and stagnation of wages. As yet, firms view unionisation as less of a threat than an occasional and short-lived nuisance. However, they do view employee turnover as a problem, as it leaves them shortages of workers from time to time, and hence they strive to ensure a more tightly controlled labour force. Moreover, no matter how low the general level of wages, firms perennially strive to lower wages even further. In both these respects, the rural hinterland, near and far, plays a role. Bengaluru garment firms have long drawn on the rural periphery of the city, even running private buses to bring workers in every day. Now, however, as brought out in a detailed report in Scroll.in, firms are turning to two additional strategies in order to “crunch labour costs” (in the frank words of one employer). Firstly, they are shifting some units to rural areas in Karnataka or elsewhere in the south of India: For example, Shahi Exports has located 21 of its 54 factories in rural areas; one employer notes that official minimum wages are 20 per cent lower there. Secondly, in recent years, employers have been bringing in recruits from distant rural areas in central and eastern India – Odisha, Jharkhand, Bihar, and Assam. Asia Floor Wage Campaign (Undated): “Asia Floor Wage: What Is It and Why Do We Need One?”, https://asia.floorwage.org/what. Bageshree S. (2016): “Study points to factors behind bad health of garment workers”, Hindu, February 29. Centre for Workers Management [CWM] and Garment and Textile Workers Union [GATWU] (2015): Wage and Work Intensity in Garment Sector: Study of Bangalore and Karnataka. Hindu Correspondent (2012): “80 p.c. garment workers come to Bangalore for sheer survival”, Hindu, September 15. Based on a survey of 2,000 garment workers conducted by V.
Narayana Chetty, Allampalli Venkataram Chair on Labour Research of Bangalore University. Jeroen Mark (2009): Stitching a Decent Wage across Borders: The Asia Floor Wage Proposal, on behalf of the Asia Floor Wage Campaign. Marx, Karl, (1990 ): Capital: A Critique of Political Economy, vol. I, translated by Ben Fowkes, Penguin edition. Mohan, Rohini (2017): “Bengaluru garment hub’s dirty secret: Sexual harassment in the workplace”, June 27. https://scroll.in/article/840363/bengaluru-garment-hubs-dirty-secret-sexual-harassment-at-the-workplace. People’s Union of Civil Liberties [PUCL], Karnataka and Women Against Sexual Violence and State Repression-Karnataka [WSS] (2016): Bangalore Garment Workers’ Protest Demonstration: A Preliminary Fact-finding Report. PUCL Karnataka, NLSIU, Bangalore, Vimochana, Alternative Law Forum, Concern-IISC, Manthan Law and Garments Mahila Karmikara Munnade (2015): Production of Torture: A Study on Working Conditions including workplace harassments facing by women garment workers in Bangalore and other districts. Sisters for Change, in partnership with Munnade (2016): Eliminating Violence against Women at Work: Making sexual harassment laws real for Karnataka’s women garment workers.